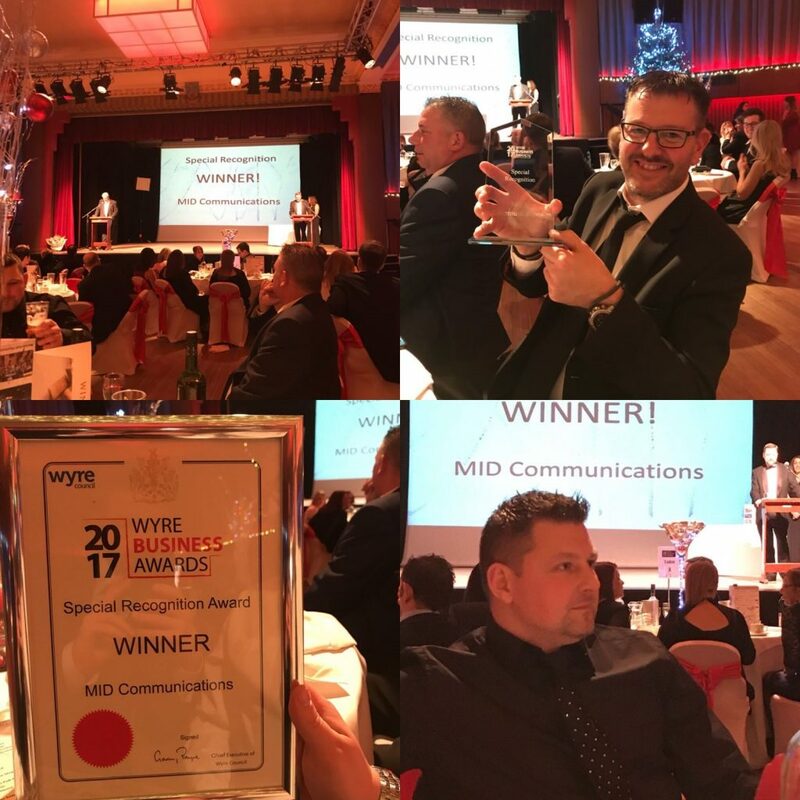 It’s always a privilege to be invited to awards ceremonies and to be nominated for awards, but winning a ‘Special Recognition’ Award at Wyre Business Awards 2017 really is a standout achievement for MID Communications, it’s something we’re extremely proud to shout about. The awards evening brought together businesses across Wyre and the Fylde Coast with the event taking place at Marine Hall, Fleetwood. It was a great event with a few faces from the MID Comms team representing on the night including our Managing Directors, Ian and Drew Murray. We went into the night with nominations for Employer of the Year and the Community Involvement Award and, although we didn’t win these awards, we came away with an award that we are immensely proud of! To be recognised in front of key businesses from all across the region for the hard work we do was unbelievable. What makes it even more special is the fact that the award will sit on display in our Cleveleys O2 store, our original store that started a massive journey with MID Comms not looking back since. Why did we win such a credible award? 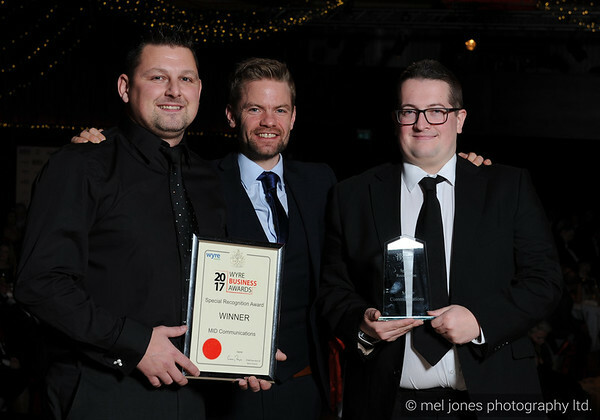 So, why did we receive a Special Recognition Award at the Wyre Business Awards 2017? At MID Communications, we’re a company that is not only proud of what we do on the business side of this but also with how we interact with people in our local communities. The award gave us recognition for our overall community support and activity in the region from the amazing work our Gurus do on a more local and personal level to SMB networking as we pride ourselves on getting involved with other businesses. Our Cleveleys store is always on the ball when it comes to getting involved with charities and their community which makes their efforts being highlighted by important people in the region so significant. Whilst it’s an absolute honour to recieve such an award, it really does hit home when you think about how the work we do outside of the offices and stores impacts those around us. From having great teams that not only drive for personal excellence but teams that work together as brand ambassadors or to ensure the customer is at the heart of everything we do – truly represents our togetherness. Working together has always been and always will be an ethos within MID Communications, it’s that passion and pride to work with those around us by collaborating and adding value to each other’s lives, whilst helping each other seek and reach our goals. But, it doesn’t stop there! Our communities also play a big part in the work we do by attending community events, interacting with professionals and embracing the change of our forever changing digital landscape. As a business, we have been shifting into a digital phase over the past 12 months and during this shift we have identified key areas to target for 2018. From areas such as implementing a better communications platform right across the North West for all our staff, a brand new internal facing website (intranet) for our people to get easy access to information and documents, a brand new website for our own content and a new vision, structure and plan for our marketing efforts and the voice/image for brand awareness. All of the above is required for our business, teams, partners and associates to achieve our goals and aspirations throughout the next financial year. Not only is it required for our own sales targets but our mission for next year is to grow MID Communications, as a brand, and become more recognised locally for the services we offer. After many brainstorming sessions and coming up with relevant words that reflect our business, we spent weeks trying to pin down a tagline that we could run with. We really wanted the tagline to incorporate mobile, because that’s what we do, but also reflect everything else that we do aside from mobile and aside from retail stores. We finalised with our Management Team and agreed on: ‘Together, we’re more than mobile’. The underlining meaning is that throughout the business we are a team of teams – one big family of individuals who add value in numerous ways but work together to strengthen or increase the value of others. We also work tirelessly with charities, organisations, councils and partners which reflects exactly why we are more than mobile. And by we’re we don’t mean us, we mean us and you – because if it wasn’t for you, we wouldn’t have the great communities we get to provide services work within. It truly is an honour to recieve this award and would like to thank you for the recognition. Its awards like this that really reflect our new slogan and why we involve ourselves across our local communities. If you’re a business wanting to involve yourself with a local charity or organisation, get your teams involved and let them choose who to go with as they will become an ambassador within your business and promote with you. This is a great way of developing togetherness within a business whilst doing great things for the community. Get yourself ready for the new year, start speaking to your teams today and have a wonderul Christmas – together, we’re more than mobile.